Heeft u een vraag voor New Siam III Guest House? Gelegen in het hart van Khaosan, is het New Siam III Guest House een ideale uitvalsbasis om Bangkok te ontdekken. Het hotel ligt 6.7 km van het stadscentrum en de belangrijkste faciliteiten zijn dus goed bereikbaar. Een plezierige omgeving en de nabijheid van Suit Art Bangkok, Phra Athit Road, Phra Arthit Pier verschaffen dit hotel een bijzondere charme. Het New Siam III Guest House biedt een onberispelijke service en alle essentiële voorzieningen om reizigers een plezierig verblijf te bieden. Terwijl u verblijft in deze geweldige accommodatie, geniet u van faciliteiten als 24-uur roomservice, wi-fi in openbare ruimtes, roomservice, vervoer van/naar luchthaven, tours. De ambiance van het New Siam III Guest House weerspiegelt zich in de inrichting van de kamers. internet (draadloos), rookvrije kamers, airconditioning, internet (tegen vergoeding), draadloos internet (tegen vergoeding) zijn slechts enkele van de faciliteiten die u ter beschikking staan. Of u nu van fitness houdt of gewoon lekker wilt ontspannen na een drukke dag, het kan allemaal in dit hotel dankzij faciliteiten als tuin. Wat de reden van uw bezoek ook is, het New Siam III Guest House is een uitstekende keuze voor uw verblijf in Bangkok. Relatief kleine kamer waar alles op en aan zit wat je nodig hebt. Perfecte airco. De ligging kan niet beter. Geen lift. Wel goederenlift voor baggage. Klein reis bureautje voor alle zaken zoals trein boekingen trips etc. Zeer betrauwbaar. Geen restaurant maar dit is geen probleem,zeer veel keuze om de hoek. Al met al prima hotel. Kamer was erg klein. Hotel zou gerenoveerd moeten zijn, maar dit was niet te zien. Personeel niet onvriendelijk, maar ze waren erg ongeinteresseerd. Keken niet op als wij de receptie voorbij liepen en zeiden geen gedag. Medewerker bij de tour desk had een agressieve houding, absoluut niet vriendelijk. Wij hebben later tijdens onze reis in New Siam 2 geslapen (net als voorgaande jaren), dit hotel is echt vele malen beter en kost maar een 2 euro meer. Onaardige en ongeïnteresseerde staff...harde bedden en veel lawaai van dichtklappende deuren.. kamer niet schoon. 2 nachten geslapen. Kamer wordt tussentijds niet schoongemaakt (geen schone handdoeken of bedden opmaken). Vriendelijkheid van het Personeel was oke. Al met al prima hotel voor niet te veel geld. Aangenaam verblijf maar vooral de badkamers zijn dringend aan vernieuwing toe. Good location if you need to leave early from Khaosan area. Rooms are a little back from the busy street, so noise not too bad. Great location, very quiet, very clean, big room, good shower and very nice staff. I arrived in the early morning and It was possible to check in early. I think one of the best cheap accommodations in Bangkok. Great location near Kaosan road and relatively quiet, with little street noise though we had some kind of bird making noise for better part of any night.. Staff not the most friendly, I got a frosty welcome because I only booked a day in advance and wasn't on their hand-written list of arrivals. Facilities getting a bit tired. A/c pretty much useless, ceiling fan did a better job. Windows have a notice you should keep them locked, unfortunately lock on one side didn't work. Bathroom ok-ish, with some stains. Overall not too bad if you're willing to live up with some issues and value proximity to the touristy area of Kaosan. We stayed at the room on fourth floor (the top floor of the building),were quite tough to stair up to the top floor without lift.Our room's safe box was broken and asked to fix it at the receptionist,but she said they can't fix it after 8 pm when tech-staff has gone. Other things are an average of the budget class room which less hot shower water,noisy neighbors.we loved a balcony faces on Rambuttri ally. 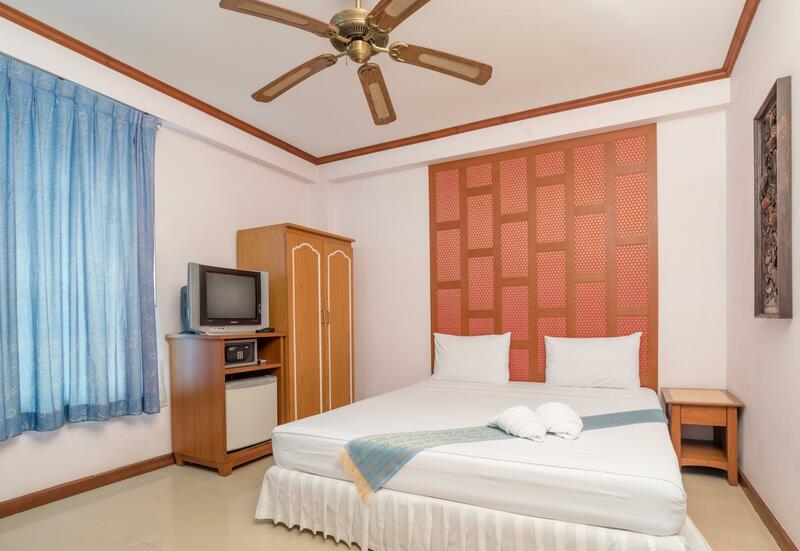 Good location not far from Khaosan road! But still quiet. Thought the room would get checked or cleaned but didn’t and had to go ask for more toilet paper. Friendly, helpful staff can speak English well. Try the all-day Big Breakfast at New Siam 1 and New Siam 2. We arrived very late (7) hours delay and room was ready and clean. We were leaving the next day and they gave late check-out no charge. Would stay here again. Very good location if you want to go to khao San road. Within walking distance of the grand palace, and close to pier 13 for the river boats which then gives you access to the sky train. The hotel does not have a lift so ask for a lower floor room if this is a problem for you. I was given WiFi log in when I checked in and confirmed the WiFi is free. The room is not big but it is big enough for 2 people and pleasantly decorated. The staff where friendly, the only thing I would change was the mattress was a little on the firm side for me but I do like a soft mattress so please don't let this put you off staying here. It was a good hotel with nice rooms and quiet at night for sleeping. We almost missed the sign entrance to the New Siam III guest house, but glad we did not! The front desk staff were awesome and we were able to check in early. We only booked one night, and wanted to stay longer, but no availability. The room wasn't very spacious, but very clean. We would definitely stay here again. The Hotel is sufficiently clean,the bed is comfortable and the bathroom relatively spacious. Aircon wasn't working first night for which we could not get a discount but it was fixed immediately in the morning. Great area and most importantly very close to the pietfrom where you get get everywhere fast and cheap. Would definitely recommend. Near the backpacker mecca of Khao San Road, but insulated from the madness down a backstreet with very little vehicle traffic (but a lot of pedestrian tourists). Five minutes' walk from the river, five minutes by taxi or tuktuk from the big tourist sights. Convenient first stop for us on a month-long trip to Southeast Asia. The personable manager booked train tickets for us and called taxis. The room was simple but clean enough, and quiet. The on-demand hot water heater was a bit finicky, but usually worked. This hotel was our introduction to Southeast Asian plumbing, with the little covered wastebasket by the toilet for used toilet paper (which could clog the sewer system), and the hand-held spray for the initial rinse. I got used to it and followed instructions, but my wife never did. Every hotel we stayed in throughout Thailand, Cambodia and Myanmar had this system, though not all of them informed the uninitiated how to use it. Awesome location. Helpful staff that allowed us to store our luggage for the day following our stay free of charge. Good price. The guest house was suitable for one night stay. The staff were friendly and helpful and the location was great, especially for the price. It is located on a lively street that is not too loud and it is just a block away from Khao San Road. Free wifi for one device only. They allowed us to store our luggage the day following check out free of charge. The nonsmoking room we received smelled strongly of smoke. The bedding was clean but the bathroom could have been cleaned better. The room and lodging seem to be in a bit of disrepair. I would recommend this to other travelers who are looking for a low cost place to stay but who are also low maintenance/ have few expectations about hotel accommodations.